Exterior House Cleaning - The Ultimate Guide - Pro Wash LLC. As most homeowners know, house cleaning isn’t strictly an inside job. Once in a while, you should pay some attention to exterior house cleaning as well. Why is that? For starters, your driveways, siding, and garage floors are very susceptible to the elements. If you’re not maintaining them, they’ll soon be covered in mildew, stains, and tire marks. Now, exterior home cleaning comes in many forms. With such a large number of options at your disposal, it can be difficult to choose the right method for your needs. For example, how do you know whether to use pressure washing or not? Is driveway sealing worth the effort? Which detergents and cleaning agents should you opt for? The good news: none of these dilemmas are that complicated. Here are the main things you should know about outside house cleaning. The standard procedure for cleaning your siding is simple enough. After rinsing it with a hose, you scrub it with soapy water and rinse again. Most laundry detergents work fine as siding cleaners. Now, what do you do if you have some mold or mildew on your siding? In this case, your best bet would be to use a standard garden sprayer and oxygen bleach. Avoid chlorine bleach, as it can strip color from your siding. First, mix oxygen bleach with some warm water to create your cleaning solution. Use a long-handled brush to apply the mixture to your siding, and leave it like that for 10 minutes. Then, use a hose to wash it off. Power washing is an option, but be careful not to go overboard. If the stream of water is too strong, it can damage stucco, masonry, and wood siding. Plus, power washing is not the most efficient way to remove mold and mildew. If you do decide to use a power washer on exterior house cleaning, be careful with it. Start on the lowest setting, and remember to use eye protection. Ideally, you should start from the top of your house and work your way down. 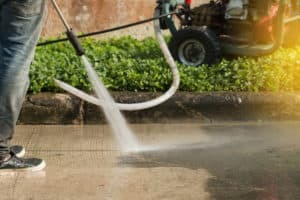 These days, most pressure washing services have access to tools that allow for more control over this process. If you have a two-story house, consider leaving this task to professionals. As you may know, oil stains on asphalt driveways are a regular occurrence. Unfortunately, rinsing them out is far from an easy task. First, make sure you don’t use any petroleum-based cleaners or detergents. The reason is simple: petroleum solvents are very effective at damaging asphalt. Dish soaps and oven cleaners are much more suited for this task. Want to protect your asphalt driveway from future oil stains? Consider sealing the driveway after you’ve cleaned it and let it dry for a few days. Again, you can either do it yourself or hire a professional driveway sealer. If you choose the DIY method, remember to get acquainted with the process. Use the right chemicals, and use a roller or sprayer to spread the sealer evenly. Once you’re done, don’t use the driveway for at least 24 hours. If you have a concrete driveway and/or garage floor, you should maintain it on a regular basis. Concrete is porous, and oil stains tend to take hold very quickly. The same goes for grease, antifreeze, and other vehicle fluids. To remove stains from a concrete surface, cover the area with cat litter or some other drying agent. Let it sit for a day, then remove it and scrub the stain with laundry detergent. Commercial oil stain removers are a good choice as well. If the stain persists, use a power washer and TSP (trisodium phosphate). In case you’re dealing with rust stains, wood bleach is a good solution. Apply it to the stained area, let it sit for a few minutes, then scrub and rinse. Your final option is to use muriatic acid. Be careful, however — this type of acid will eat away both the stain and the concrete underneath it. If you do decide to go for it, remember to wear a respirator and protective clothing. By comparison, removing tire marks from a sealed concrete surface is far easier. First, remove the sealer by scrubbing it with a solvent or chemical stripper. Once the stain has disappeared, reseal the concrete. Why seal your concrete floors in the first place? Other than preventing future stains, the sealer makes your floor look more attractive. There are many types of floor sealers out there, from epoxy coatings to acrylic sealants. Your exterior house washing efforts shouldn’t be limited to your siding and driveways. Your roof, deck, and patio also need some love. Roof cleaning is mostly about getting rid of mold and mildew. Using sodium hydroxide solutions is a good way to rinse away black streaks and other stains. This will also extend the lifespan of your roof. If you have a paver patio, you should sweep it with a broom as often as you can. In case some dirt and grime persists, rinse it off with water. Again, pressure washing is best avoided unless necessary. In some situations, one of your patio pavers may be stained or damaged beyond repair. The good news: you can replace it without interfering with the other stones. The procedure lasts a few hours, and your patio will look as good as new. Finally, give some thought to deck maintenance. As a general rule, wooden decks are prone to deteriorating without regular care. Also, sealing your deck every 2 to 3 years can do wonders against the sun and rain. As you can see, exterior house cleaning is not a day’s job. That said, a well-presented exterior can drastically improve the look of any property. If you’re selling your house, a beautiful exterior can also serve as a powerful marketing tool. Should you leave the exterior house cleaning to the professionals? Well, it all depends on how comfortable you are with the tasks we’ve mentioned above. Still, it’s worth noting that most house cleaning services are quite cheap these days. Do you live in Nashville or Middle Tennessee? If so, we may be the perfect exterior cleaning service for your needs. Contact us right here, and we’ll get back to you soon.